Last year Jane nearly lost her life taking down a deadly family of vampires who preyed on the helpless local populace. Now, after months of recuperation, she’s back and ready to fight again. Except this time, she’s been hired by those she’s trained to kill - vampires. 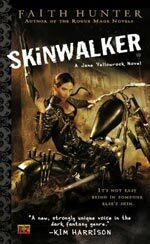 Jane Yellowrock is the last of her kind—a skinwalker of Cherokee descent who can turn into any creature she desires and hunts the undead for a living. But now she’s been hired by Katherine Fontaneau, one of the oldest vampires in New Orleans and the madam of Katie’s Ladies, to hunt a powerful rogue vampire who’s killing other vamps. Amidst a bordello full of real “ladies of the night”, and a hot Cajun biker with a panther tattoo who stirs her carnal desire, Jane must stay focused and complete her mission… or else the next skin she’ll need to save may be her own. Skinwalker is the first novel in a new urban fantasy series by established fantasy writer Faith Hunter, author of the Rogue Mage series. Unlike the Rogue Mage books Skinwalker is set in current day America and follows the adventures of Jane Yellowrock, a vampire slaying skinwalker who wants to collect the bounty on a rogue vampire that is terrorising the population of New Orleans. Jane Yellowrock’s character was first introduced in “Signatures of The Dead” a story in the recently published Strange Brew anthology. The events covered by that story were narrated by Molly, Jane’s witch friend and while Jane’s hunt of, and subsequent fight with, a group of killer rogue vampires makes an excellent prequel to Skinwalker it’s not necessary to have read that story before reading Skinwalker. In Skinwalker Jane takes over narration of the story, although it could be more accurate to say that Jane and Beast take over the narration of the story, since Jane’s character contains two distinct entities. Jane is a skinwalker, a creature of Native American myth, who can shapeshift into any creature she wants as long as she holds a fetish (a small collection of bones, teeth or feathers) of that creature. At some point in the past Jane shapeshifted into the form of a mountain lion and stole the soul of that mountain lion in the process, trapping Beast (the lion) inside her forever. Whenever Jane changes into Beast’s body Beast takes over the narration of the story. Beast is a big cat, scent-orientated and predatory. This makes for a radical change in writing style, which initially did take a few chapters to get used to but soon seemed to become more natural. The perspective changes often since Jane tracks the rogue vampire as Beast yet hunts the rogue as Jane, where weapons and opposable thumbs give her the advantage. Jane makes a strong yet realistic protagonist, she is lively and tough yet she doesn’t fall into the trap of being too sarcastic and too arrogant in her strength – neatly avoiding turning herself into an urban fantasy heroine cliché. Jane remains something of a mystery right through to the end of the book. Her past is lost to her memory and the small discoveries she makes about herself only serve to raise more questions. Skinwalker is a vamp-centric story. Apart from some witches and Jane herself it isn’t clear if there are other types of mythological creatures in this world. Still the vampires are more than capable of holding centre stage for the duration of this story and like Jane herself, as the vampire’s mysteries are revealed it only leads to more curious questions. Skinwalker is a fantastic start to the Jane Yellowrock series. 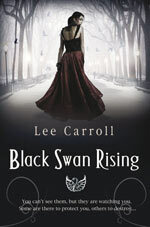 Mixing fantasy with a strong mystery storyline and a touch of romance it ticks all the right urban fantasy boxes. Fast paced plotting and an imaginative use of Native American and vampire mythology are just the icing on the cake. More please! You can find out more about Faith Hunter’s books and read an excerpt from this novel at the author’s website. Visit Faith’s website.